According to answer key, Cannizzaro reaction of 3-hydroxy-2,2-dimethyl-1-phenylpropan-1-one (a ketone) takes place but how is that possible when we know only aldehydes show Cannizzaro reaction? There are a number of discussions on this site regarding the Cannizzaro reaction. In strong base there are competing reactions (aldol self-condensation) that can occur with ketones that have at least two hydrogens vicinal (next to) the ketone. Even aldehydes suffer the same fate. That is why the aldehydes are usually aromatic. But I believe in this case reduction may well be facilitated by an intramolecular hydride transfer. Intramolecular reactions are, as a rule, faster than intermolecular reactions owing to the high concentration of the reacting species. The keto alcohol 1 forms alkoxide 2 which reversibly adds to formaldehyde. 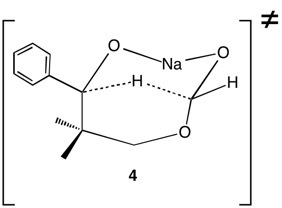 Intramolecular hydride transfer occurs in intermediate 4. The formate group is saponified (5 ---> 7) forming the diol 9 and sodium formate 8. The deprotonation 7 ---> 8 should not be taken literally. Base and water intercede. Just saving space. 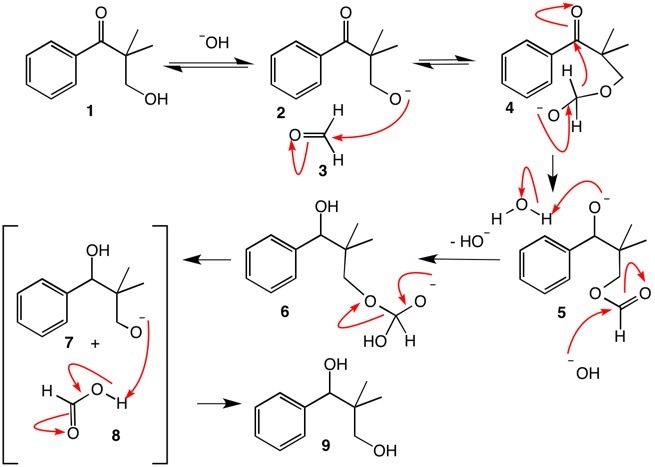 See transition state for reduction below reaction mechanism. Not the answer you're looking for? Browse other questions tagged organic-chemistry carbonyl-compounds or ask your own question. What reaction takes place here? Can terminal enols be reduced by using LiAlH4? Can 1, 3, 5-trihydroxybenzene perform haloform reaction? Can bridged and bridgehead positions be chlorinated using free radical mechanism?